The incidence of heart diseases is increasing all over the world, and now-a-days it can strike a person at a relatively younger age than a couple of decades earlier. Physical inactivity and associated obesity, smoking, having a sweet tooth, and being a fast food junkie are some of the modern day sins that can put you at a risk of many cardiovascular diseases. Add to it, if you have a family history of heart disease, the chances are high that you could be in a danger zone for angina, heart attacks, stroke and other cardiac problems. Myocardial Infarction (MI) or heart attack is one of the most common diagnoses in hospitalized people. It generally occurs when there is an abrupt decrease in coronary blood flow (coronary arteries are the vessels feeding the heart) due to a blood clot occluding an already narrowed artery. In roughly one half of the cases, a precipitating factor appears to be present prior to a heart attack, such as vigorous physical exercise, emotional stress, or a medical or surgical illness. It may commence at any time of the day or night, but the frequency is highest in the morning within a few hours of awakening. Although pain is the most common presenting complaint, it is by no means always present. The incidence of painless infarcts is greater in individuals with diabetes, and it increases with age. In the elderly, a heart attack may present as a sudden onset of breathlessness which may progress to pulmonary edema or choking of lungs. 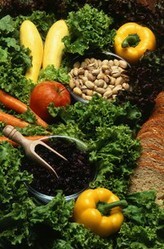 Fruits and Vegetables - These are loaded with vitamin-C and carotenoids. They add bulk to food and reduce the number of calories consumed. You should have at least 4-5 servings of fruits everyday. Another 5 portions of leafy vegetables and roots in combination with fruits are essential. Garlic contains special ingredients that reduce harmful fats ( triglycerides) and decrease the risk of heart diseases. Whole Grains and Fiber - Whole grains have high fiber content and complex carbohydrates. They also have a low glycemic effect (that is, blood sugar levels do not show major fluctuations after a whole grain rich meal). Legumes - Increased intake of peas, beans, lentils, and soybean reduce cholesterol and provide isoflavinoids which have a beneficial effect on blood vessels. 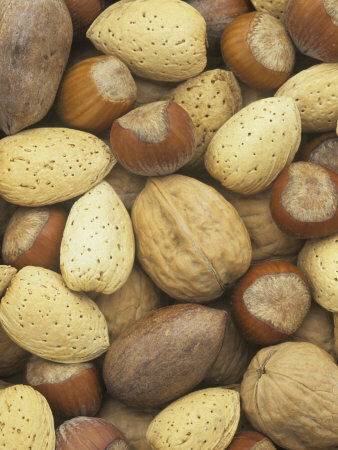 Nuts - Nuts are a rich source of mono unsaturated fatty acids, the good fats. Walnuts also contain poly unsaturated fatty acids. Almonds reduce blood lipoprotein levels, thus causing a substantial reduction in blood cholesterol levels.A fistful of nuts 2 to 3 times a week are good for cardiac health. Dietary fat - Dairy foods, meat, and hydrogenated fat are high in saturated fats and trans fats that increase blood cholesterol levels. While olive oil and canola oil contain mono unsaturated fatty acids; and sunflower and safflower oil are rich in poly unsaturated fats and are the healthier options. Fish and Fish oils - Consuming fish (especially fatty fish salmon and tuna) at least once every week reduces cardiovascular risk. Eating fish also boosts vitamin-D levels, which has a protective effect on heart health. Two portions of fish per week are recommended. Fish are high in omega-3 fatty acids like Eicosa Pentenoic Acid (EPA)and Docosa Hexenoic Acid (DHA) that have multiple health benefits, like maintaining a smooth blood flow and reducing inflammation. Salt - Excess salt intake causes a rise in blood pressure. Over the shelf foods, pickles etc are laden with salt and should be avoided. The recommended salt intake is about 4 to 6 gms per day or about 2400 to 2600 mg sodium every day. Alcohol - It is recommended in moderation, about less than one drink per day for women, and not more than one drink per day for men. Wines in any form, particularly red wines appear to be better. Dark chocolate, tea in moderation, and plenty of water are equally good on a long term basis. Adequate balanced diet containing loads of vegetables, fruits, nuts and fish with whole cereals, and avoiding oily and fatty meals is an essential part of a heart disease prevention regime. Metreye, Do you know where white chocolate -- the only chocolate I like -- fits into a healthy diet? Somehow with our life becoming sedentary and the availability of junk food, we are losing much of goodness of natural organic food and healthy diets. I agree with you that we need to follow a healthy diet to keep our heart healthy.